Following the death of former Apple CEO Steve Jobs, a monument in his memory was set up on the campus of an IT institute in St. Petersburg (Russia). Resourced by domestic company Western European Financial Union (WEFU), the Jobs monument consisted of an oversized iPhone whose touch screen the public could interact with. However, when Tom Cook—Apple’s successive CEO—came out as gay in a public essay, the larger-than-life electronic device was taken down. Some Russian media reported that the fixture was simply under repair. But allegedly, the monument was taken down in order to comply with Russia’s infamous anti-gay ‘propaganda’ laws. Nonetheless, observers speculate that the removal could not solely be traced back to bigotry. Writing for Fortune magazine, Philip Elmer DeWitt reports that President of WEFU Maksim Dolgopolov also cited supposed links between Apple and the NSA as a reason behind the iPhone’s confiscation. More broadly, Adam Chandler at The Atlantic suggests that this was an act of defiance against the presence of American symbols in Russia. In any case, the Russian Holdings Company put the exiled monument up for sale—with US $ 95,000 as the asking price! Adam Chandler. “Why Russia Really Tore Down Its Jobs Memorial.” The Atlantic, November 3, 2014. Accessed November 29, 2014. http://www.theatlantic.com/international/archive/2014/11/steve-jobs-memorial-torn-down-after-tim-cook-comes-out/382319/. Philip Elmer-DeWitt. “Why Steve Jobs Memorial in St. Petersburg was Removed.” Fortune, November 3, 2014. Accessed November 29, 2014. http://fortune.com/2014/11/03/why-the-steve-jobs-memorial-in-st-petersburg-was-removed/. “Monument To Apple’s Jobs Removed in Russian After CEO Comes Out.” Radio Free Europe, November 3, 2014. Accessed November 29, 2014. http://www.rferl.org/content/russia-st-petersburg-monument-iphone-jobs-cook-gay/26671992.html. Mike Wehner. “Buy the Steve Jobs Monument that was Too Gay for Russia for $ 95,000.” Engaget, December 2, 2015. 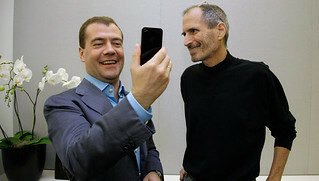 Accessed January 15, 2015. http://www.engadget.com/2014/12/02/buy-the-steve-jobs-monument-that-was-too-gay-for-russia-for-95/.